So it’s that time of year again, chocolate, cheese and alcohol overload and a midriff that shows it! But the one thing i can’t handle after the indulgence, is eating teeny tiny portions and no snacks in between to try and shift the weight. Guaranteed if you starve yourself, after keeping it up for a week, you’ll be so hungry you’ll binge on EVERYTHING. What a waste that will be. So instead of eating less, just eat right and remember good fats are good for you, don’t be afraid of them. They are great for energy levels and for keeping you fuller for longer and you will lose weight if it’s part of a balanced diet. Ok so you may have a Friday night treat, but your only human. I certainly won’t be doing dry January, i work bloody hard, i like my New Zealand Sauvignon Blanc on a Friday eve! 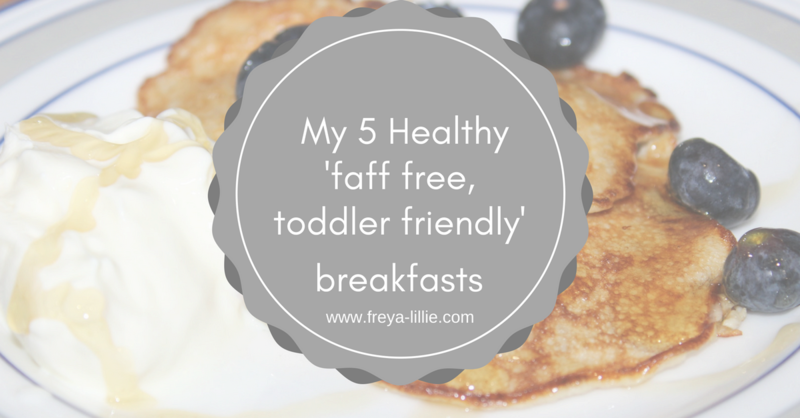 Anyway enough of the waffling, this month, each week i will give you my top 5 healthy snacks, lunches, breakfasts and dinners that are all faff free (don’t you hate it when it takes 5 times as long to prepare and cook than to eat it) plus they’ve all been tried and tested on one two year old. Plus my top 5 exercises to do at home with a toddler watching and even joining in too. They will most definitely enjoy it more than you! So there are lots of variations on the internet and these are great if you don’t have time on a morning to make anything. Please don’t ever skip breakfast, that’s just silly. Breakfast starts your metabolism moving, gives you energy and has been known to switch on that dark lightbulb inside your head. You can literally grab these from the fridge and take them to work. Made the night before, preparation time is around 5 minutes. The great thing is they keep you full all morning! You can totally mix these up and add in mashed banana, raw cacao if you like it chocolatey or anything else that’s a bit healthy. Ok so you don’t need instructions for this, although poaching an egg is an effort at times. I literally fill a pan 1/3 full, bring the water to boil, turn down to medium/high heat and pop in the eggs for around 3 minutes. Add a little salmon or a turkey steak to jazz it up! This may actually be the breakfast i cook most often. My toddlers favourite, well actually one of mine too. 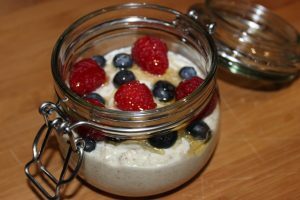 If you have a little time in the morning these are great and super simple. Mash the banana with a fork until the lumps are pretty much gone and then whisk in 2 eggs. Add a little coconut oil to a frying pan, medium to high heat and using a large serving spoon, spoon in the mix. The pancakes are more runny than a normal pancake so keep them small and let them cook on one side. Check the under side is golden brown before flipping. Use a spatula and carefully slide half way under before slowly flipping. These only take a couple of minutes to cook. 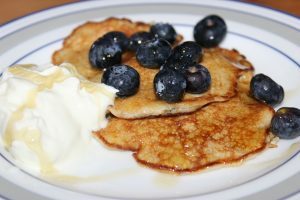 When cooked popped them onto a plate with a dollop of greek yoghurt, a sprinkling of blueberries and a drizzle of honey. 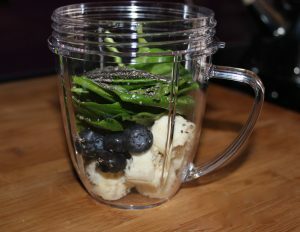 Ok so you never have enough ingredients for a smoothie or time to chop up and prepare?? Well don’t worry, i have the answer. Purchase yourself some freezer bags and after shopping day, in each one make sure you add a handful of greens. I usually use spinach, i promise you will not taste it one little bit! Chop up the other fruit you desire, mix and match so each one keeps it exciting. Add to the freezer bags along with your spinach and pop them into the freezer. No waste, no faffing each time. Just grab your choice of smoothie from the freezer, add it to the mixer along with some water, you could also use coconut water or almond milk too. 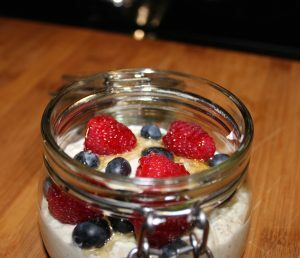 Give it a blast and your good to go, totally healthy breakfast in less than a minute! What better way to have your five a day. I usually pop in some chia seeds for an extra added superfood boost. 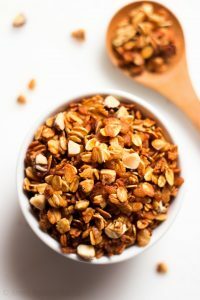 I sometimes add a couple tablespoons of flax seeds, or linseeds to give it an extra boost. Heat your oven to 190 and have a silicon or baking tray. Melt the coconut oil and honey together for a few seconds in the microwave and add with the rest of the ingredients in a large bowl and mix well. This just makes it easier to mix. Spread the mix onto the baking tray and add to the oven for around 20 minutes giving it a little stir half way through. You can also add in raisins or cranberries or any other nuts you desire. When it has cooled pop it in a tubaware box and enjoy throughout the week with either your choice of milk or my favourite, greek yoghurt!